BLOG – Ponder or Act, you Choose! It has been fascinating to ask people in our Introduction to Conversational Intelligence® events if they can think of a time when someone really pressed their buttons, or if they can think of a person who seems to have this skill in abundance! Go on, have a think about it yourself. Can you think of a time? Who presses your buttons? As we explore these occurrences, it is astonishing to hear the strong emotions that are identified. Emotions like anger, frustration, betrayed, annoyed, confused, shocked. What is equally astonishing is that some of these instances which remain a trigger for strong emotion took place years ago! And just as interesting, as you will see from the list above, most people default to a negative memory… not one filled with joy, hope, positive anticipation, and feel good. Knowing how to build conversations that create space to transform, trigger more useful parts of the brain, and be self aware about our own conversational style and its impact on others is at the heart of Conversational Intelligence®. The brain is of course not easily represented in a picture as we lose the dynamic three dimensional complexity. As a result of all we are now learning in the field of neuroscience, we now know a great deal about the neurochemistry of the brain when in different kinds of conversation, and know how to get the best out of our conversation by giving the brain the best chance of an effective conversation. This is a tiny peep at neuroscience. 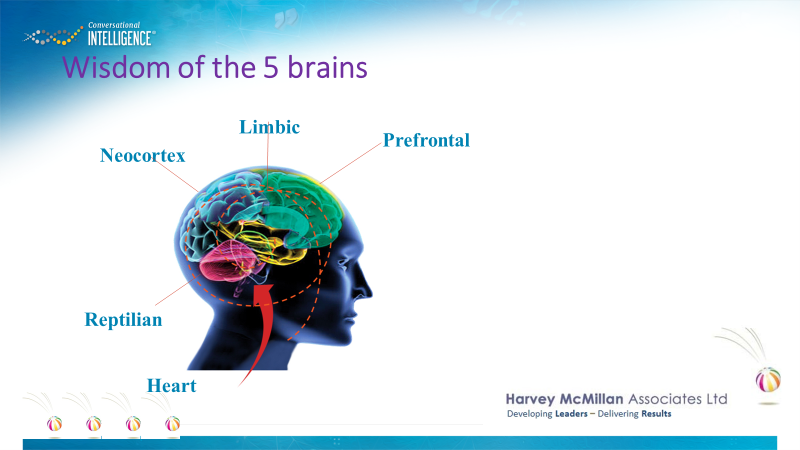 When we link all that we know about neuroscience and the opening up of more and more information about the brain – we can use this powerful body of work to look at how to have the most effective conversations, how to identify our own conversational style through using one of the survey tools, and equip ourselves with effective skills and behaviours for great outcomes in relationships, teams and organisations. Conversational Intelligence® (C-IQ) tools and models also allow us to be more skilful at navigating conflict in a more productive way. Our clients and participants in our one day Introduction to C-IQ events are learning the skills to transform relationships and organisations. We hope this blog will give you a glimpse of the possibilities of Conversational Intelligence®, confidence that the work is based on evidence based research, and a desire to join us in applying the tools and models to our mutual future success. For dates of forthcoming Introduction to C-IQ days drop us an email. We are also happy to travel for groups of 6 or more. We are also in the process of setting up a closed online group for further development and discussion for those who have attended one of our days to embed the learning and share experience of using C-IQ. This entry was posted in Uncategorized on 12/05/2017 by Martha. This conversation is going nowhere! You know the kind of conversation I mean. You’ve probably been part of one… where every new sentence adds a new layer of complexity, frustration, and helplessness as each person seeks to have his or her point of view heard to the extent that no one is actually listening. Taking a position in a conversation can be useful, but it can also become a block to further dialogue and resolution. At that point you are simply looping the loop together until someone either escalates it, walks away from it, or gives up the will to live. Conversational Intelligence® gives us a number of frameworks based on the latest neurological evidence, to understand how to have better conversations. And since every relationship, team and organisation is built on relationships, sharpening up you C-IQ is a very good thing. I am delighted to be one of the first people globally to be trained and certified by Judith Glaser to deliver learning and development using the full range of C-IQ models, tools and assessments. Initially we are running 3 Introduction to Conversational Intelligence full day learning experiences in Aberdeen, Glasgow and Edinburgh. We expect to continue to run these on a rolling programme. Be the first to learn how to skilfully get more out of your conversations! Full details from Jillian at Jillian@harveymcmillan.co.uk, my leadership development company. This entry was posted in Uncategorized on 20/02/2017 by Martha. I’ve been reading Margaret Heffernan’s little TED Book on things which are Beyond Measure: the big impact of small changes. As a coach I have often drawn two lines on a page to form a wedge to demonstrate that a small change on a consistent daily basis will achieve a huge change over time. However, going back to the question of culture in organisations, over the 10 years I’ve been working independently as an Executive Coach, and facilitating Leadership Development for senior teams, the most frequently raised topics have revolved around organisational culture and organisational communication. At last I believe that the body of work known as Conversational Intelligence (C-IQ) developed by Judith E. Glaser has the potential to transform organisational culture through having intelligent conversations. Two years ago I read Judith’s book, and have been using some of her work with clients ever since: the simplicity of her tools when combined with the latest research in neuroscience form an impactful and intelligent body of work which profoundly impacts on client’s ability to improve conversations at individual, team and organisational level. This has the ability to transform organisational culture. Everything begins with a conversation. So here’s a challenge for you to undertake over the next week… On a scale with 1–10 with 10 being high, rate at least three of your conversations every day and start to think about how you could improve your conversations, your relationships, your culture and your overall outcomes. Martha was so impressed with Judith’s work that she decided to be at the front of the queue if the opportunity came to be accredited. She has been studying in the first cohort with Judith for most of this year and is now delighted to be part of a small global team of high level coaches and consultants about to be accredited. This will allow her to use the full range of C-IQ tools, and to deliver Conversational Intelligence training and development for clients whether that is through Executive Coaching, Team Coaching, Focus days, Strategic away days for Senior Teams, Revisiting Conflict Resolution and Handling Difficult Conversations through C-IQ. This gives a few examples of where C-IQ can be integrated into your life and work. C-IQ is beginning to transform conversations globally… be an Early Adopter on this and be at the front of the queue in expanding your own Conversational Intelligence (C-IQ). Talk to me informally about how C-IQ can shift your conversations, relationships, culture and outcomes. This entry was posted in Uncategorized on 18/10/2016 by Martha. I pay attention when I hear or see a similar phrase that emerges in different places or at different times. You know the kind of experience I mean. You hear a new word (or an old word you haven’t heard for a while) and before you know it you are coming across a cluster of them. Purpose has been following me around since yesterday! For me purpose is at the top of the metaphorical food chain when it comes to life and living, whether that’s personal life or professional life. If you can be clear about your sense of purpose, then everything else flows from that. This Marshall Goldsmith quote sums it up nicely: “Giving yourself a purpose adds clarity to all the actions and decisions that follow.” So if you have a sense of purpose and are clear about what it is, you can be clear about what actions you need to take to fulfil your purpose, and decision making becomes much easier. Every decision becomes a straight forward question: Does this take me nearer to fulfilling my purpose, or further away? It’s a kind of spiral… clarity of purpose, will bring clarity of thinking, clarity of action, clarity of decision making and so it goes on. Was musing yesterday about merging the two words “Creative” + “Purpose” = Creative Purpose. What could this mean? Here are some of my doodles which are all in the form of questions (my trade as a coach is asking good questions!). What could ‘creative purpose’ mean? What would happen if I brought my creativity and my sense of purpose together? What does purposeful creativity look like? Is there a benefit in creativity without purpose? In what ways could I be creative about my life purpose/my career purpose? Clarify your purpose… then add some creativity and see what happens. Would love to hear from anyone who experiments with this idea. This entry was posted in Uncategorized and tagged actions, creative, creativity, decision making, decisions, flow, life and living, Marshall Goldsmith, Purpose, purposeful, sense of purpose on 30/08/2016 by Martha. This is a picture of my grandfather, Thomas Gordon, taken many years ago. It’s easy to see what his passion was!! Begonias. His memorial cup can still be won at the Ayr Show each year. His passion was fired and fuelled by spending hours tending his precious plants, trying various combinations of soil, feeding, light position, and learning from every attempt to get the most beautiful large flower heads just at the right time each year. He learned too from other gardeners, and reading Gardening magazines and listening to Gardener’s World. Every year he learned more and his passion grew. There was no room for excuses when it came to his passion. So what is your passion? What do you spend hours tending, trying various approaches, learning from every attempt, reading and listening about to gain greater skill in something that will bear fantastic flowers at the right time? If you don’t really have a passion you might like to spend some time with an appropriate coach exploring your sense of meaning and purpose, or your sense of identity and values. I challenge you in this moment… Go find your passion, and when you do commit to it with enthusiasm and excitement… and then watch the flowers grow in your life. This entry was posted in Passion and tagged Ayr Show, begonia, begonias, coach, enthusiasm, excitement, feeding, flower heads, gardeners, Gardeners World, identity, learning, light, meaning and purpose, no excuses, passion, plants, right time, skill, soil, values on 25/05/2015 by Martha. All over Aberdeen at the moment are dolphin sculptures, brightening up various parts of the city. These colourful artworks are everywhere, and a talking point for residents and visitors alike. This photograph was taken in Hazlehead Park last week when I was working with a group of Managers, and having fun along the way! Although there is a serious side to dolphins, they are also playful and intelligent. I read a Mark Twain quote this week which I’ve been pondering: “Work and Play are words used to describe the same thing under different conditions”. I’ve been wondering how well I integrate both of these concepts into my daily routine. I consider myself to be really fortunate to run my own businesses and therefore be my own boss! However, even for me there is a need to check in sometimes and check out: To what extent am I having fun today – and if not what am I doing to change it!!? So have fun at work and work hard at having fun! And if you haven’t got the balance right – change it! This entry was posted in Balance and tagged Aberdeen, artwork, balance, change, colourful, dolphin, fun, Hazlehead, integrate, intelligent, managers, Mark Twain, play, playful, residents, sculptures, visitors, work on 08/08/2014 by Martha. What to do when you are ‘stuck’? The picture was taken in Italy on a walking holiday when after a shower of rain the muddy clay was an inch deep on the bottom of our boots. A friendly helper to the rescue! I’ve been working as a professional coach for seven years and have come to recognise that when clients are ‘stuck’ a number of things may be happening! (1) Being stuck is a feeling as well as a thought. What does being stuck feel like for you? What images does the word stuck conjure up for you? (2) Being stuck may be completely unconscious.. I don’t know I’m stuck but I know things are not as I want them to be. (3) Being stuck may be precisely what the feeling is immediately prior to a significant breakthrough. The stuckness can almost be like a labour pain (!!) – great when it’s over but part of the journey to success. (4) Being stuck may be a feeling created by overload and the stress level of the situation simply leaves one unable to take the next step. When recognised and confronted honestly (sometimes with another trusted person in a supportive but challenging environment) stuckness can be reframed from a Barrier to a Door just waiting to be pushed. The other side of stuckness is a great place to be! So, what to do when you are stuck? Pay attention to the feeling and the thoughts associated with that feeling. Know that it is temporary – if you choose it to be. Know that one step at a time may be the way to go… and seek professional or informal support from someone who can be both supportive and challenging to help you get to the other side of stuckness. Someone who can be your best coach through the process. This entry was posted in Goals and Progress, Uncategorized and tagged barrier, breakthrough, challenging, clay, coach, door, feeling, helper, Italy, labour pain, muddy, next step, overload, professional coach, reframe, reframed, rescue, stress, stuck, stuckness, success, support, supportive, unconscious, walking on 01/08/2014 by Martha. Are you doing what you love? If not, what's stopping you?